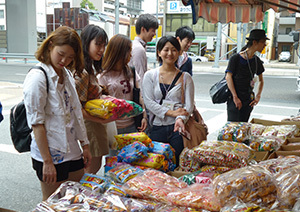 The Japan-Korea Student Exchange Seminar in Nagoya was held on September 24-27, 2014. There were 12 students from Japan and 12 students from South Korea. 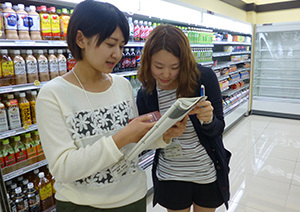 The students made a presentation about their activities in each country, and also made a tour to co-op store in Kinjo Gakuin University Co-op. The seminar gave an opportunity for the students to learn from each other. Comments from Japanese students who participated are written below. I heard Korean language right after I arrived at the meeting place. And there were Korean students in front of me. 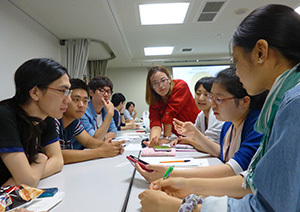 Almost all Japanese students said, “Hello.” And then I felt, could we really do this? This feeling crossed my mind for a moment, but then somehow it went away. We discussed about university co-ops and shared the current situation, concerns and opinion. We were able to obtain a new perspective from the fruitful discussion. During break, we taught each other Japanese and Korean language. Sometimes we talked about Japan-Korea relations and future challenges ahead in dinner or free time. I was happy to participate as their guide to my university. I cannot speak Korean nor English, so I was anxious to think that I might encounter difficulty in communication. My impression is that Korean participants had strong interests in various things. They seemed to be very conscious to learn something from Japan and bring it back home. Looking at them, I feel a strong urge to take notes and ask questions in the future about things to be implemented in my university when I participate in such seminar or other events. We would like to continue to hold seminars that can contribute to each other and Japan-Korea exchange seminars that can broaden the interests on co-operative.